Readers may recall a story that appeared here earlier this year heralding the rediscovery of a long-forgotten manuscript by Beatrix Potter. Penguin editor Jo Hanks unearthed the material while conducting research for a new addition to Emma Thompson’s revival of the series. “I found a reference to a letter from Beatrix to her publisher that referred to a story ‘about a well-behaved prime black Kitty cat, who leads rather a double life,’” Hanks recalled in an online discussion in January. Intrigued, Hanks searched among the author’s papers in the V&A Archive at the Victoria and Albert Museum. Tucked away were three handwritten manuscripts for The Tale of Kitty-in-Boots. The manuscript had remained untouched for over a century, and in her notes Potter acknowledged that the text was incomplete. Hanks lightly edited the material, and the story was published by Frederick Warne (a subsidiary of Penguin) on September 6 to coincide with the sesquicentennial of Potter’s birth. Kitty-in-Boots is accompanied by a CD of the tale, read by actress Helen Mirren. Written in 1914, on the eve of the First World War, the story is about a mischievous, gun-toting, boot-wearing black cat named Miss Catherine St. Quintin, better known as Kitty to the kind old woman who keeps her. Kitty has a split personality; by day, she’s a content, well-fed houscat. At night, her doppelganger Winkiepeeps trades places so that she may go hunting fully decked in a gentleman’s jacket and fur-lined boots--a British Puss-in-Boots, but with a bad attitude and an air-gun. One night Winkiepeeps tells Kitty about ferrets chasing rabbits, and the bloodthirsty creature can’t resist the temptation. This particular outing is doomed from the start: the air-gun misfires repeatedly, Kitty misses just about all her targets, and a trap ensnares the ferocious feline. Since Kitty is chasing hares, it’s only fitting that Peter Rabbit is part of the spectacle as well, but in this story he’s old and fat, brandishing an umbrella that he weaponizes better than Miss Kitty does her gun. Peter’s also more clever than Kitty, outsmarting her at every turn. Finally, after losing her toe in a trap set by fellow hunter Mr. Tod the fox, Kitty renounces her hunting ways and turns to more civilized pursuits. In addition to the aforementioned Peter and Mr. Tod, characters from other Potter stories make brief appearances as well. How does a 100-year-old tale about a murderous cat sit with modern readers? It may be tempting to quickly denounce a book that so enthusiastically describes feline bloodlust, but, it’s quite tame when compared to all that contemporary media has to offer, and Kitty learns a valuable lesson about hunting innocent creatures for sport while she awaits rescue. The manuscript was discovered with only one illustration--a rough sketch of Kitty and Mr. Tod. 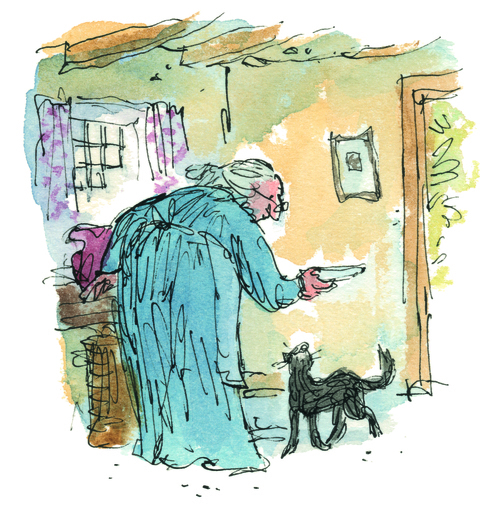 Award-winning illustrator Quentin Blake was tapped to bring Potter’s story to life. Beloved for his work illustrating books by Roald Dahl and Russell Hoban (among many others), Blake’s scratchy pen-and-ink artwork bustles with activity, conveying the impish Miss Kitty and her riotous animal coterie. Certainly, Blake’s illustrations will never be mistaken for Potter’s, but they are marvelous, modern adaptations to what is sure to become a new classic. Readers may recall a story that appeared here earlier this year heralding the rediscovery of a long-forgotten manuscript by Beatrix Potter. Penguin editor Jo Hanks unearthed the material while conducting research for a new addition to Emma Thompson's revival of the series. "I found a reference to a letter from Beatrix to her publisher that referred to a story 'about a well-behaved prime black Kitty cat, who leads rather a double life,'" Hanks recalled in an online discussion in January. Intrigued, Hanks searched among the author's papers in the V&A Archive at the Victoria and Albert Museum. Tucked away were three handwritten manuscripts for The Tale of Kitty-in-Boots. The manuscript had remained untouched for over a century, and in her notes Potter acknowledged that the text was incomplete. Hanks lightly edited the material, and the story was published by Frederick Warne (a subsidiary of Penguin) on September 6 to coincide with the sesquicentennial of Potter's birth. 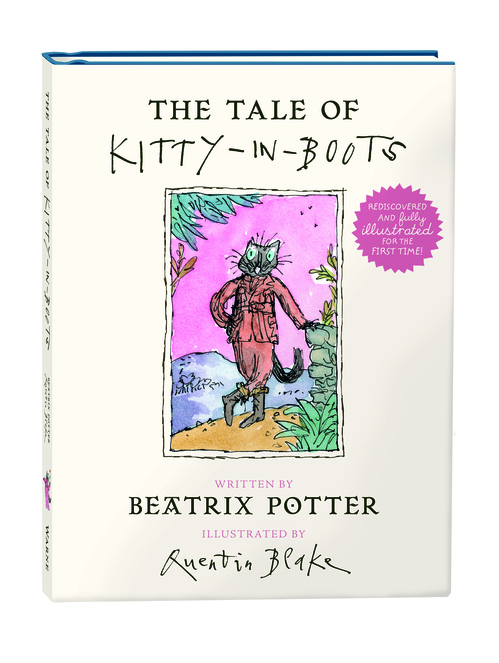 Kitty-in-Boots is accompanied by a CD of the tale, read by actress Helen Mirren. Written in 1914, on the eve of the First World War, the story is about a mischievous, gun-toting, boot-wearing black cat named Miss Catherine St. Quintin, better known as Kitty to the kind old woman who keeps her. Kitty has a split personality; by day, she's a content, well-fed houscat. At night, her doppelganger Winkiepeeps trades places so that she may go hunting fully decked in a gentleman's jacket and fur-lined boots--a British Puss-in-Boots, but with a bad attitude and an air-gun. One night Winkiepeeps tells Kitty about ferrets chasing rabbits, and the bloodthirsty creature can't resist the temptation. This particular outing is doomed from the start: the air-gun misfires repeatedly, Kitty misses just about all her targets, and a trap ensnares the ferocious feline. Since Kitty is chasing hares, it's only fitting that Peter Rabbit is part of the spectacle as well, but in this story he's old and fat, brandishing an umbrella that he weaponizes better than Miss Kitty does her gun. Peter's also more clever than Kitty, outsmarting her at every turn. Finally, after losing her toe in a trap set by fellow hunter Mr. Tod the fox, Kitty renounces her hunting ways and turns to more civilized pursuits. In addition to the aforementioned Peter and Mr. Tod, characters from other Potter stories make brief appearances as well. How does a 100-year-old tale about a murderous cat sit with modern readers? It may be tempting to quickly denounce a book that so enthusiastically describes feline bloodlust, but, it's quite tame when compared to all that contemporary media has to offer, and Kitty learns a valuable lesson about hunting innocent creatures for sport while she awaits rescue. The manuscript was discovered with only one illustration--a rough sketch of Kitty and Mr. Tod. Award-winning illustrator Quentin Blake was tapped to bring Potter's story to life. Beloved for his work illustrating books by Roald Dahl and Russell Hoban (among many others), Blake's scratchy pen-and-ink artwork bustles with activity, conveying the impish Miss Kitty and her riotous animal coterie. Certainly, Blake's illustrations will never be mistaken for Potter's, but they are marvelous, modern adaptations to what is sure to become a new classic.